Most think it was invented by an unemployed Pennsylvanian who sold his game to Parker Brothers during the Great Depression in 1935 and lived happily--and richly--ever after. That story, however, is not exactly true. 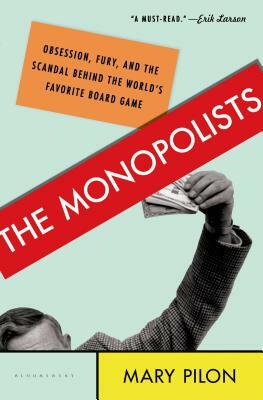 Ralph Anspach, a professor fighting to sell his Anti-Monopoly board game decades later, unearthed the real story, which traces back to Abraham Lincoln, the Quakers, and a forgotten feminist named Lizzie Magie who invented her nearly identical Landlord's Game more than thirty years before Parker Brothers sold their version of Monopoly. Her game--underpinned by morals that were the exact opposite of what Monopoly represents today--was embraced by a constellation of left-wingers from the Progressive Era through the Great Depression, including members of Franklin Roosevelt's famed Brain Trust. Mary Pilon is an award-winning staff reporter at The New York Times where she currently covers sports. She previously worked at The Wall Street Journal, where she wrote about various aspects of economics and the financial crisis. She has worked at Gawker, USA Today, and New York Magazine and is an honors graduate of New York University. Her work has garnered awards from the Freedom Forum, the Society of American Business Editors and Writers and she was part of the Journal's team that won Gerald Loeb and New York Press Club Awards in 2011 for covering the “Flash Crash” of 2010. She made the Forbes magazine's first-ever 30 Under 30 list for media. A native Oregonian, she currently lives in New York City. Visit her web site at marypilon.com and find her on Twitter @marypilon. "The tale is as infuriating as it is fascinating." —Carlos Lozada, Washington Post, "The whiniest, funniest, creepiest and most memorable books of 2015"
“[A] dive into the real Monopoly.” —Flavorwire, "10 Must-Read Books for February"